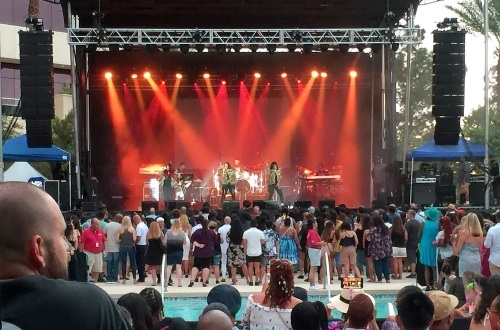 H.A.S Productions deploys al-Class line arrays and hs-Class subwoofers for 7,000 poolside fans at Red Rock Hotel and Casino in Las Vegas. Selling more than 65 million records worldwide, TLC’s blend of pop, hip-hop, and R&B ignited a legion of loyal fans who are ready and willing to sing aloud to “No Scrubs,” “Waterfalls,” or “Creep.” Last month the group drew more than 7,000 fans to the Red Rock Hotel and Casino in Las Vegas—delivering the venue’s biggest show to date. For TLC, H.A.S. selected VUE Audiotechnik al-Class line arrays and hs-Class subs. The main PA consisted of left and right CST hybrid clusters each consisting of 8x VUE al-12 large-format elements, augmented with four medium-format al-8 elements providing down fill. The hybrid configuration took full advantage of VUE’s unique Continuous Source Topology (CST), allowing Hall and his team to achieve precise vertical coverage, lower hang weight and improved sight lines without the sonic disruptions associated with typical mixed-element arrays. Low-frequency support was also VUE. A total of 12x VUE hs-221 dual 21-in ACM subwoofers spanned the front of the stage in a pair of physical gradient (arced) end-fire directional arrays. The configuration produced optimal directional characteristics with excellent low-frequency cancellation on-stage, while ensuring wide and smooth radiation throughout the audience areas. VUEDrive Systems Engines provided all power and processing for the line arrays while on-board VUEDrive electronics powered the subs. A pair of Avid VENUE Profile consoles handled both front of house and monitor mixes.